Yes, there really is an Ayla. About 22 years ago, she found herself losing her passion for her then profession, that of Director of Human Resources in corporate America. Many afternoons and evenings, she would visit a local bead shop in Evanston on her way home from work. Admiring the merchandise led to taking classes on beading techniques, and soon Ayla was spending nearly all of her free time designing jewelry or thinking about beading patterns. As luck would have it, as Ayla’s beading hobby started to take off, the owner of the bead store Ayla had been frequenting decided to retire. Was it karma or kismet that drew Ayla to beading? We don’t know for sure, but within a few short months Ayla had resigned from her day job and taken over the lease of the beading store. She created her own line of jewelry, Ayla’s Own, which was soon featured in the Art Institute of Chicago and Field Museum Gift Shops, and well as numerous publications including North Shore magazine, Women’s Wear Daily, Chicago Tribune and Pioneer Press. Ayla also accepts private commissions, one of which was to design jewelry for the Northlight Theatre in Skokie, IL. In 1998, Ayla moved the store, now renamed as Ayla’s Originals, to its present location on Sherman Avenue in Evanston. 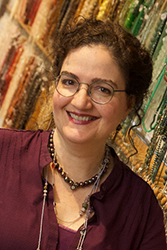 Over the past 20 years, Ayla’s has become a sought-out resource for experienced beading talent as well as novices from throughout the North Shore and beyond. Ayla’s Originals offers freshwater pearls, Czech glass, Swarovski crystals, antique trade beads and gemstones from all over the world. The array includes vintage and antique beads, as well as a roster of classes, private lessons, and private party options. In 2016, Ayla’s Originals celebrated their twentieth anniversary in Evanston, an occasion acknowledged by Evanston’s Mayor via an official proclamation. Ayla and her husband, Joe Pizzo, reside in Evanston, a city they love and support in many ways, public and private. Copyright © 2019 Ayla's Originals - A Bead, Gift and Jewelry Boutique.